The Third Hand is a push pole holder that mounts on the top of your poling platform. When you’re poling from your platform, and need to put the pole down quickly to make a cast, or to help a friend land a fish; you simply “snap” the pole in your Third Hand. You don’t have to put the push pole in the boat. Leave one end of the pole dragging in the water. The Third Hand will adjust to the movement and direction of your boat. Your pole will be held firmly in place until you are ready to resume poling. The Third Hand is made of rugged, space age, white Delrin plastic, with stainless steel hardware. Third Hand rotates 360 degrees, and pivots both up and down. Moving parts are adjustable for tighter or looser movement. Push poles are held in place by a heavy duty PVC gripper that is available for all diameter push poles. 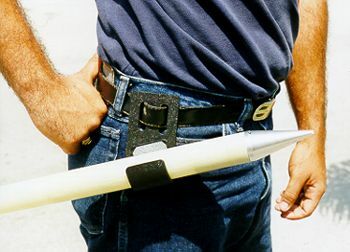 The POLEHOLDSTER is a push pole holder that attaches to your belt. When poling from your platform, and you need the use of both hands, you simply “snap” your push pole into your POLEHOLDSTER on your belt. You don’t have to put the push pole in the boat. Leave one end of the pole dragging in the water. 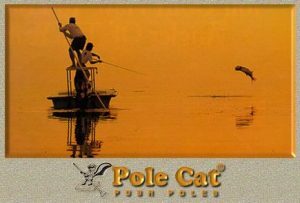 The POLEHOLDSTERtemporarily holds your pole and allows you to make a quick cast, or provides a rest break, or allows the use of both hands for some other use. The POLEHOLDSTER is made of rugged, space age, ABS plastic, with stainless steel hardware. The POLEHOLDSTERwill pivot up and down slightly for a comfortable temporary hold. The POLEHOLDSTER will hold all diameter push poles. Don’t let your valuable push pole be stolen, or bounce out of your pole holders on rough water days, or fall off your boat when trailering. STAKE OUT LINES SOL 8′ nylon rope with SS snaps on each end to connect boat to stake out pole. Platform Pole Holster PHW Pole Holder Attaches to side edge of poling platform.